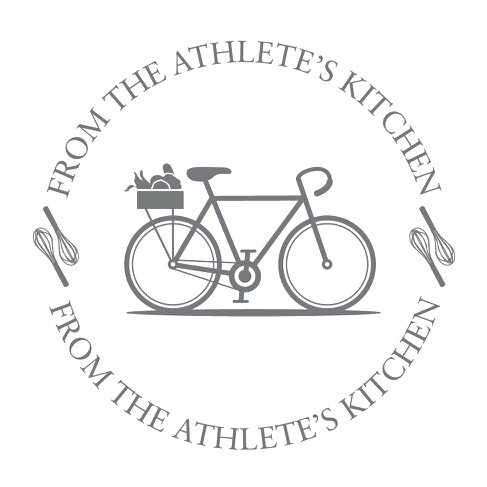 Back in October when we were working on our kitchen project, one of the things I posted about was the backsplash and decision making therein. A detail I didn’t get into at the time is that it is almost always essential to take sample tiles home before committing. As such, tile stores will lend you tiles to take home or sell sample sets. Aforementioned Heath Ceramics sold me three samples each of our two viable color choices, returnable for store credit. The Heath store is an interesting study in curation because you have not so much a mix of high and low – although to track the price points is to enter a world of hope and rejection – but a collection of classic, well made items. Some of which can be had for about the same cost as a few sample tiles. Enter this Lodge brand 8″ skillet, which I’ll be honest merchandises beautifully among a display of wool blankets, handmade wooden kitchen tools, cookbooks and hand blown glassware. I even first told myself, back away from the merchandising. Ultimately this cutie made it into our collection because besides making fun things like skillet cornbread, it keeps whatever’s baked or cooked warm for awhile thanks to the cast iron. Plus, it’s just a workhorse. I’ve seen one chef sear a lamb chop in a cast iron skillet and then just throw the entire thing into the oven for finishing. Also, I think it was $18, $8 or so after our tile credit and I suspect it will outlast all other pots & pans. 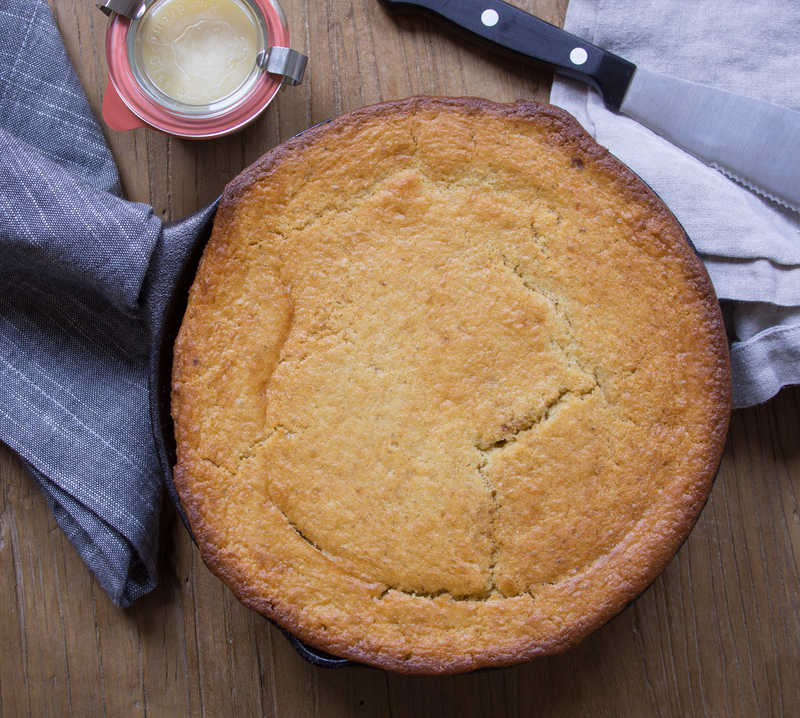 Anyway, this cornbread. I’ve made it twice so far, and it’s a reliable version – moist, flavorful and not too sweet, which lets it swing both ways. Honey butter or maple infused Greek yogurt would work well on this, but it’s also the type that would make a great stuffing. It has olive oil instead of shortening, which gives a richness of flavor in addition to moisture. 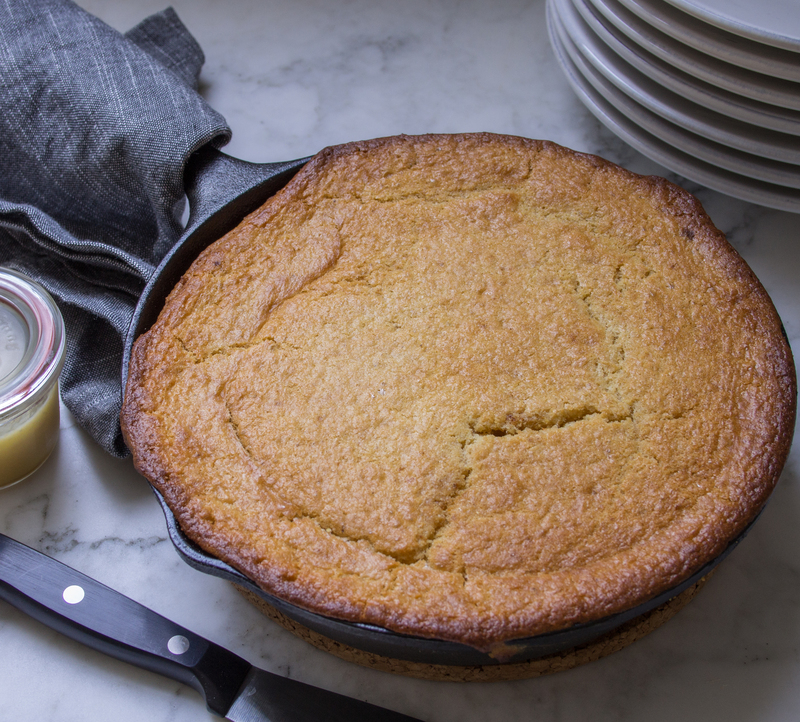 (That’s also why it’s a recipe makeover – so often the fat in skillet cornbread is shortening.) Finally, you’ll see there is a step of adding milk and lemon juice together. This sounds weird, but it’s really just the way to make homemade buttermilk. I’ve noticed that whenever I buy buttermilk specifically for one recipe, I use a little bit and then it just sits. That said if you have buttermilk in the fridge, feel free to use that in place of the milk. Oh, I found the bones of this recipe on FrugalFamilyTimes.com and updated certain ingredients to our tastes. Thanks Ed and Robin! Special Equipment: 8″ cast iron skillet or 8″ baking pan. First, combine the milk and vinegar and set aside. Combine cornmeal – baking soda in a mixing bowl and whisk to incorporate. Add sugar, oil and homemade buttermilk and stir gently until completely incorporated. Batter will seem very liquid-y. Set the skillet over low heat and add the butter. Swirl it around to coat the entire pan as it melts. Pour the batter into the prepared skillet – the batter will go right to the brim – and bake for 20-25 minutes. Cool on a wire rack or trivet at least 15 minutes before serving.